Exactly one month ago, when the Treasury reported its latest monthly budget deficit, we noted that Federal spending surged in March, rising 7% from $392.8BN from a year prior to $420BN, the second highest monthly government outlay on record, and with tax receipts disappointing, it meant that the March budget deficit of $208.7 billion was 18% higher than $176.2BN deficit recorded last March, and was the biggest March budget deficit in US history. Fast forward to today when anyone who took this one month and extrapolated it as an indication of US economic health got the shock of a lifetime, when the US posted its largest monthly budget surplus on record in April, and the highest Federal Government Receipts ever - at just over half a trillion dollars - which the Congressional Budget Office said reflected stronger economic activity over the past year. 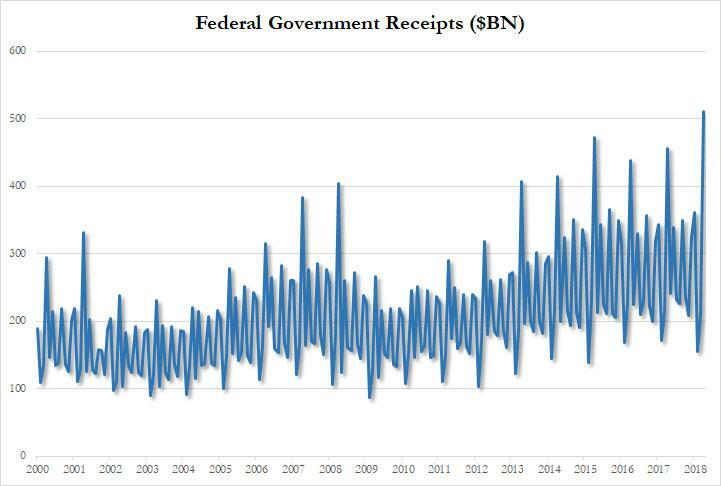 In many ways, April was a mirror image of March: unlike March, Federal receipts in April soared to $510 billion, 12% or $54.8BN more than April 2017, and the highest Federal receipts not just for an April but any month in history (although of that surge, approximately $20BN was due to one additional day of collections in April 2018). For those wondering if the culprit was tax repatriation, the answer is no: net corporate income taxes totaled $42.2BN in April and $120.8BN so far in fiscal 2018, 7 months into the year. The latter is down $39.2BN (24.5%) from the corporate taxes collected at this time last year; overall gross receipts were down 14% to $159.1BN while refunds up 53% to $38.3BN. as corporations become an increasingly less relevant source of government funding. Meanwhile, on the spending side, outlays increased by a more modest 8.4% to $296 billion, the latest monthly budget statement reported. 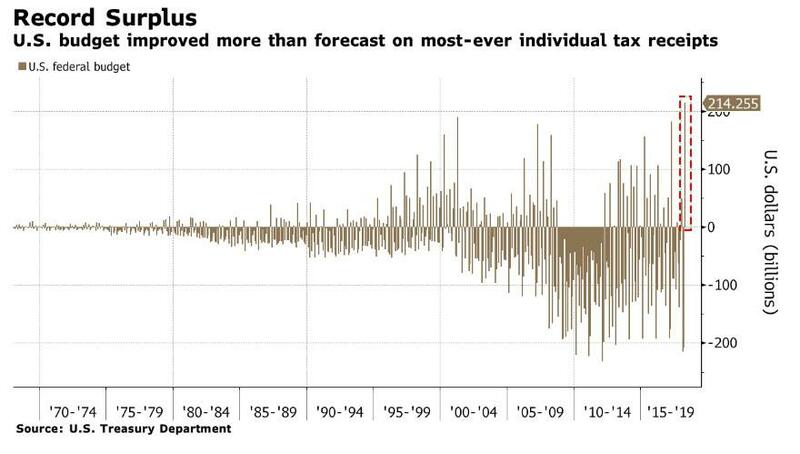 Combined, this meant that the monthly surplus was $214.3 billion, the highest since records started in 1968. While the number was modestly below the CBO's May 7 estimate of $218 billion, the number was well above the Wall Street consensus of $194BN, and well higher than the $182BN surplus in April of 2017. While the federal government traditionally posts its biggest budget surplus in April when taxpayers file and pay their tax returns, this years was a blockbuster in every possible way: in a May 7 preview of the report, the CBO said that a stronger economic expansion and income growth added to federal revenue in April (there was no mention of taxes collected on cryptocurrency gains). 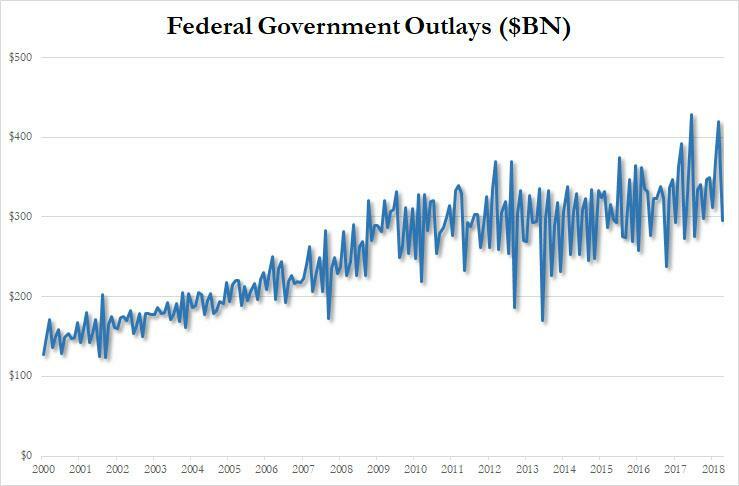 Overall, the budget deficit for the first seven months of the fiscal year widened to $385 billion, from $344 billion a year earlier, according to Treasury, although it was sharply lower than the $600 billion cumulative YTD deficit reported last month. That said, don't expect the good times to continue indefinitely: Trump's tax cuts and spending increases are expected to push the budget deficit to $804 billion in the current fiscal year, from $665 billion in fiscal 2017, and surpass the $1 trillion-mark by 2020, according to the CBO. Others, such as Goldman, are confident that the US debt funding needs will surpass $1 trillion as soon as this year. The Trump administration has countered that tax cuts will pay for themselves through faster economic growth, and if April is any indication, it may be right.